As cruise ships are not able to dock here you will be tendered ashore to the center of town. Originally settled by European pirates and slave traders, this happy mixture of many bloods prospered and became a picturesque fishing village, elected one of the 10 most beautiful areas in the world, famous for its unique combination of rustic charm, architectural harmony, incredible beauty and sophisticated boutiques and restaurants frequented by discerning visitors who come from all over the world to savor its magic. Originally a sleepy fishing village, Buzios was brought to the world's attention in 1964 by Brigitte Bardot who holidayed here for a number of years. So grateful were the locals for having put them on the map, they erected a statue in her honor. There is no high-rise development here and buildings are all villas and small hotels with rustic, tiled roofs which blend in very well with what can only be described as a Mediterranean landscape. 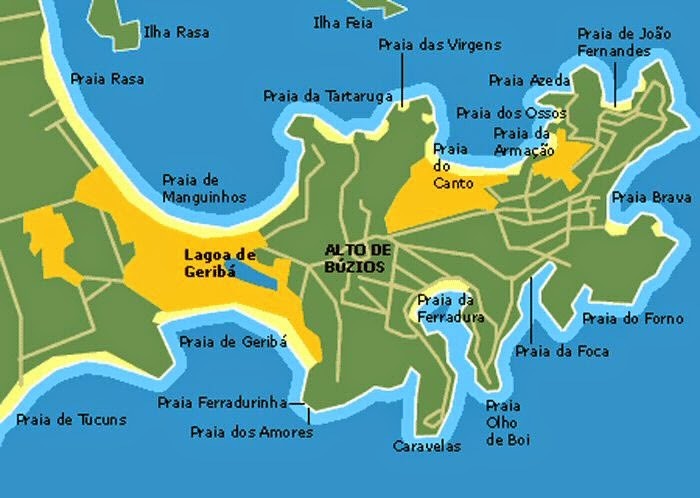 Buzios is well known for its beaches and there are 24 of them to choose from. You can rent taxis, one can take a local tour on the Buzios Trolley or rent one of Buzios' dune buggies for the day and explore on your own. Several local operators offer tours to local beaches and islands. One fun way to get around is via water taxi and explore the nearby beaches. Several vessels leave from Armação Beach, downtown, normally in the morning and early evening with prices from R$ 25.00 to R$ 50.00 per person, for rides that go by several beaches and islands in Búzios. The rides take between 2 to 5 hours, depending on the ride you choose. Right as you disembark the tender, you will find the very start of Buzios' wonderful shopping opportunities. "Orla Bardot" (Bardot Promenade) adjoins the tender wharf and connects the beaches to the downtown shopping street of Rua das Pedras.